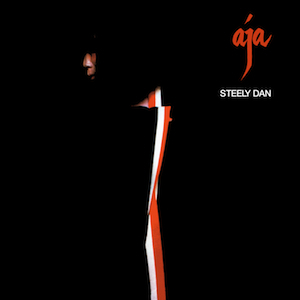 Released in 1977, Steely Dan's sixth album, Aja, begins with what is perhaps my favorite of the band's songs. "Black Cow" a bitter little number, lyrically speaking, but the way the music unfolds is remarkable. It opens up with sparse instrumentation grooving on that one, main riff. Then, as the minutes pass, the band layers additional tracks on top - clean rhythm guitars, doubled backing vocals, saxophones, additional keyboards, a horn section... The sonic impact creates a powerful, emotional, rising crescendo despite the fact that none of the instruments are really exploding like they would on a hard rock album. By the time the song reaches the outro, instruments are hitting you from all points in the stereo field and the album has its claws sunk into you. You'd better get comfortable, because you're not going anywhere until the LP is over. But sonically, "Black Cow" sets the stage for the rest of the album. The harmonies, for example, are perfect in a way that's simply frightening for fellow musicians. Steely Dan had a knack for layering harmonies on top of each other, but not just for the sake of the harmony - they could somehow match each voice's and instrument's timbre perfectly to the harmony it played, creating tones that are far richer than anything else you'll hear. It's particularly instructive to listen to compare the sounds on this album to the sounds on basically any modern record. Today, we're in the age of infinite digital possibilities and maximum polyphony. Anything that could ever be done in any music studio in the history of the twentieth century, plus sonic combinations that never would have been possible during any other epoch, is available at our fingertips... Yet, for all our technical superiority, we still haven't matched the arrangements and production on classic albums like Aja. It just goes to show you: there are some things technology cannot accomplish. Having a brilliant musical mind - one equpped to match timbre to note to emotion - is one of them. We need Becker and Fagen for that kind of thing, and thankfully, we have them. Nearly every song on this album is a classic. You've heard them even if you think you've never heard them. These tracks decorate the airwaves in every department store, elevator, classic rock radio station, and grocery store you can imagine. You can try to resist, but ultimately I don't know anyone who truly dislikes Steely Dan. Their sound is as much a part of the social fabric in America as that crinkly crepe paper folded into a new dress shirt at Macy's. There's a reason for that. But what happens when you come to Steely Dan through the usual channels is that you can sometimes fail to appreciate the music on its own merits. Aja is the answer to this subconscious bias toward the music. For example, it's impossible to ignore the crushing drum solo at the tail end of the title track; it's impossible to keep your mind from exploring the intricacies of its xylophone notes. It's too easy to get lost in the story of "Home At Last," essentially a retelling of The Odyssey through the medium of "jazz rock." But the groove is so heavy, and yet the vibraphone notes panned far-right offer a soft relief from it. And speaking of heavy, Aja just happens to close with what is perhaps the band's all-time heaviest number: "Josie." Aja is sonic perfection, it just is. If you've ever wondered why people go so nuts for Steely Dan, start here.